Learning to play music can have a very powerful and positive effect on young people. 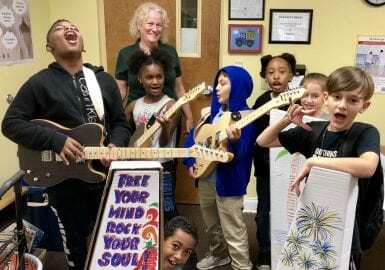 High-quality instruments are in need for teens in schools and local organizations. Build-a-Guitar® was created and trademarked to serve this need. 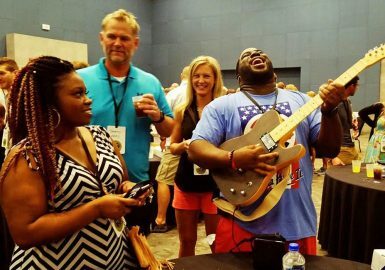 These guitar kits were specifically designed to provide a unique and exciting company event. 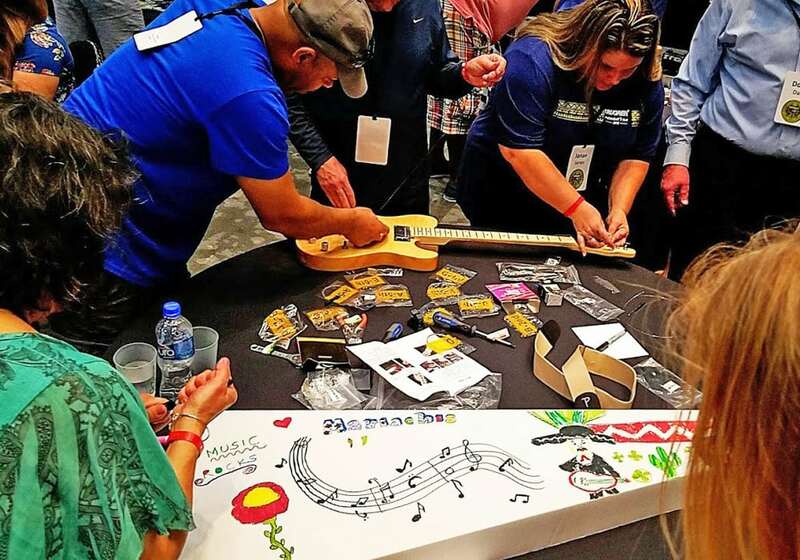 This worthwhile program incorporates iPads with engaging audio/video clues as well as fun challenges and activities, enabling teams to earn the parts necessary to assemble the guitars. Throughout the program, participants will be capturing photos and videos of each other in action. After a fun icebreaker to get everybody rockin’, all groups will receive their iPads and instructions. As teams continually gain points through the iPad challenges, they will be rewarded with trips to our music store to obtain the parts needed. During assembly, periodic inspections will ensure the guitars are built to precise specifications. In addition, teams will design and decorate a special white guitar box to reflect the unique personality of their Band. Our Build-a-Guitar® kits also include a tuner, audio cable, the guitar strap, picks, and even a personal amplifier! Once all guitars are built, don’t be surprised if a spontaneous jam session and photo op break out. 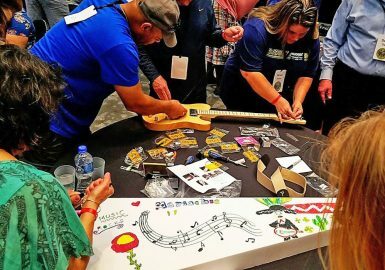 So, let’s get rolling and build some guitars for future musicians of America, who will never forget your wonderful gift to their school or organization. At the conclusion of the program, a local charity or school representative may address your group and thank you for your donation. To ensure the success of the experience, aspects of this event may be modified for your group size, group makeup, time available, and other variables. Build-a-Guitar® is a registered trademark of Best Corporate Events. As Salesforce employees, we are always looking for events to participate in for charity, and this is one they will talk about for a long time. 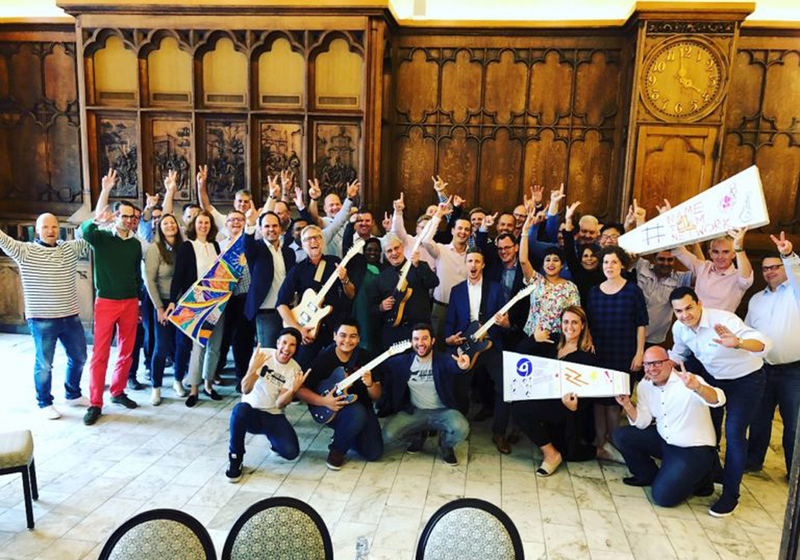 Your lead facilitator was a great host, and our Build-a-Guitar event was perfectly organized. Answering music trivia questions was fun, as was doing the group videos and singing. The entire program was so fun, and it was great to see the team interacting and each one doing their part according to their strengths. Our group was still talking about this yesterday, and saying this was the "coolest" volunteer event they've ever participated in! Our group of 650 TruGreen employees had an amazing time at their event. The best team building aspect of the Build-a-Guitar program was seeing the teams work together. The most fun was seeing the end results of our attendee's efforts and the kids playing the guitars. Our Build-a-Guitar with iPads was an extremely organized event. The icebreakers at the beginning of the program were great. The iPad activities we needed to act out in front of our group was the most fun. Our group loved the activities and charitable aspect of the program; all of it was absolutely amazing. Can’t wait for the next one! THANK YOU again so much for your time yesterday. 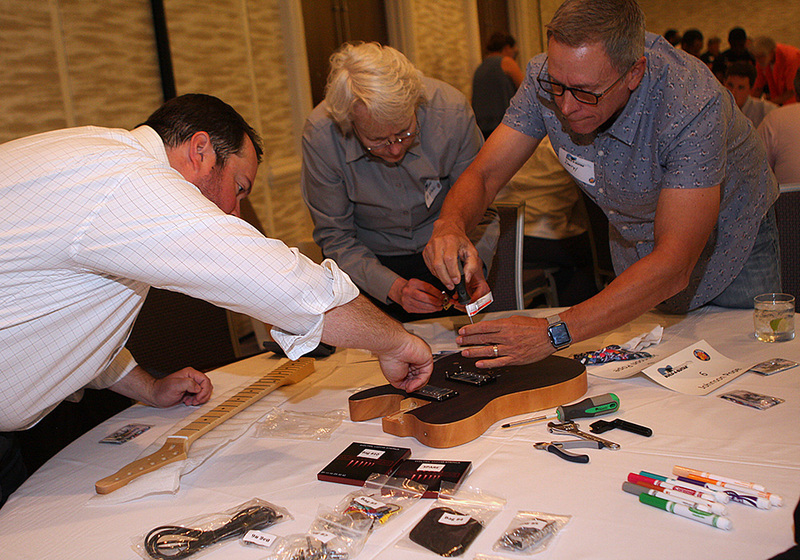 All the attendees had a blast with the Build-a-Guitar activity. Both you and your staff were amazing! I hope to work with you again in the future. We can’t wait to get all the pictures and videos that were captured on the iPads so I can share with our clients. When I contacted our national charity organizations, including the Boys and Girls Club, about what instruments are most needed for their music programs, they all said guitars! That turned out to be a real challenge, but I am thrilled to finally be able to add this cool program to our lineup of charitable CSR events. I say finally because the key was the guitar. You can’t build a DIY guitar in an hour because they need to be sanded, stained, coated and then assembled, which takes hours because it involves gluing necks, drilling holes, and soldering connections. So we hired a top guitar company to build us a guitar kit from scratch, with instructions, that could be assembled in an hour without all the steps mentioned above. They are excellent quality; one-of-a-kind guitar kits build exclusively for Best Corporate Events and they sound great! And each guitar comes with a strap, tuner, picks, and even an amplifier! 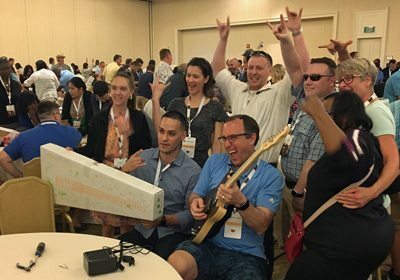 The iPad challenges were a really fun part of our Build-a-Guitar program! The teams enjoyed the actual building of the guitars because they learned something new. 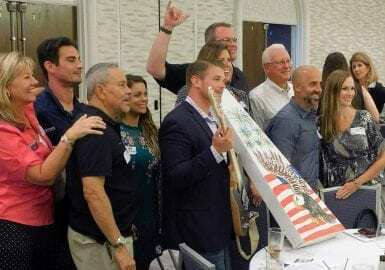 Our group enjoyed both the activities and the charitable aspect of the event as well. Everything went better than expected. Your lead facilitator and her team were amazing. We have done your Build-a-Guitar program in the past, and I have recommended you to other groups. The best part of our Build-a-Guitar event was watching the teams work together and laugh and have fun! The event was very organized and our staff had everything laid out and set-up in an orderly fashion for our program. The pictures we took of the team while doing the different planned photos was the best! It was great to have the principal of the school come and tell us about the program. That was very special. We will definitely use Best Corporate Events again! 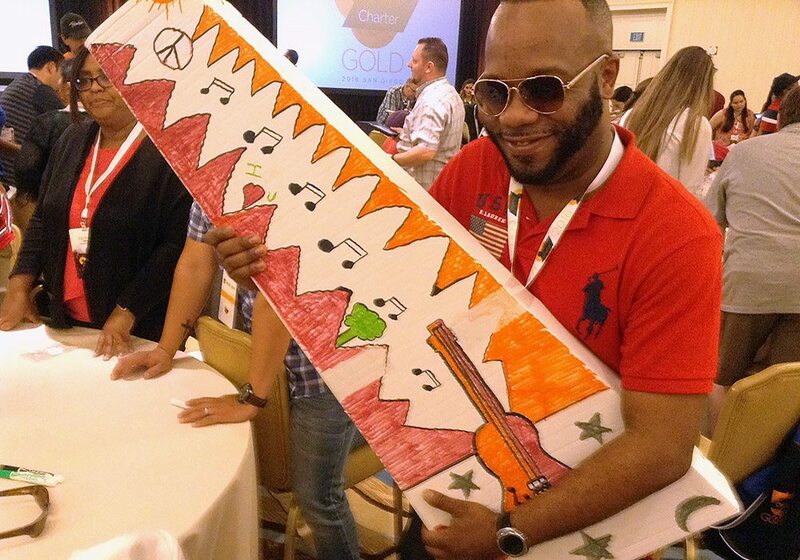 Your lead facilitator was excellent and the entire Build-a-Guitar program was extremely organized and well run. Getting a disparate group of people to work together for the first time to build and market their guitar was the ultimate team builder. The most fun was the judging portion and marketing category of the guitar build. Everyone seemed to genuinely enjoy the activity and the charitable component - Great Spirit was present throughout the event. The best team building aspect of the program was getting the group working together on something totally 'outside' their wheelhouses. The entire program was so much fun! The activities gave the group a great sense of satisfaction that working together they could do something for their community and give a little of themselves. Our facilitator was very fun as well. Pricing varies depending upon the number of participants (minimum of 30) and includes guitars, personal amplifiers, audio cables, straps, guitar boxes, the team building program, preparation, production coordination, a professional lead facilitator and staffing.